Le confort et la commodité de notre condo sont difficiles à battre. Marchez 150 yards à Snowflake ascenseur ou 1. 5 blocs à la rue Main. Lorsque vous prenez une pause de toutes les activités qui Summit County a à offrir, se détendre dans un cadre confortable recroquevillé sur des canapés en cuir confortables. Assis à côté de la cheminée, vous pouvez profiter de la vue sur le balcon ou regarder votre émission préférée sur la télévision à grand écran plat. Une grande cuisine, récemment rénové avec comptoirs en granit et appareils en acier inoxydable offrent le confort de la maison, mais la vue sur la montagne sur la fenêtre de la cuisine ne vous laissera pas oublier votre réglage. 2 chambres à coucher / 2. 5 salles de bains et un canapé-lit en font le lieu idéal pour les couples et les familles. Les chambres à l'étage offrent également une vue magnifique sur les montagnes. Avec un parking souterrain couvert, un ascenseur, un bain à remous sur place et la navette gratuite dans la rue, l'emplacement est fantastique. Les chambres bien aménagées créent une parfaite atmosphère détendue et confortable pour vos vacances Breckenridge. We had a wonderful stay at this property! The condo was roomy and spacious for our group of 4 adults. This condo was in a great location! Town was an easy, short walk away, and we loved walking to the Snowflake lift each morning and skiing in on the 4 O'clock Run at the end of the day. The underground parking and ski closet located right outside the condo were also great perks of this rental! The condo's kitchen was well equipped for all of our cooking needs. We would definitely stay here again for future ski weekends in Breckenridge! Two blocks from Peak 8, walk/bus to Peak 9 and town. Great set up for two couples with large kitchen/great room on the first floor and bedrooms upstairs. Kitchen had everything we needed. Nicely upgraded with charming decor and comfortable furniture. Hot tub was lovely. Overall a very pleasant stay! Really enjoyed our stay at this condo. It was well located, just a couple blocks to the lift and a short walk from the town. The condo is well equipped and very comfortable. We were two families with one teenager and found everything we needed. Our only criticism would be of the hot tub which is a community hot tub, and it was not very clean. Thank you for providing us with a lovely home to celebrate the holiday! Place was great and the owners were very attentive and helpful to ensure our stay was enjoyable. Great owners who really want to help make sure you have a good time. Willing to help you with your trip and get to know the area. We loved the place and it was so convenient to the Main Street. We hiked and loved that there was a pool and hot tub close by. The beds and furniture is new with well kept great kitchen if you want to cook. We like to eat out so we didn’t do to much cooking. Would recommend me d staying here. Nice to have three bathrooms too! Ryan & Michelle were very quick & responsive to all of our questions. 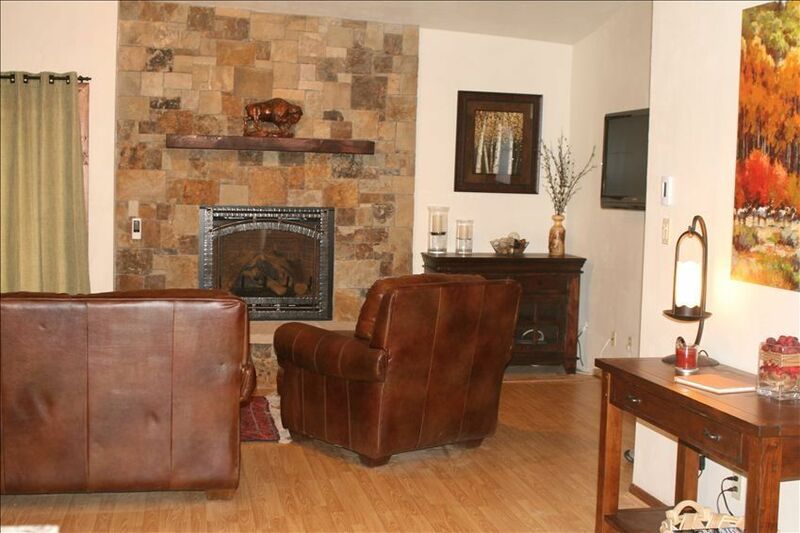 The property is spacious and very convenient to Main Street. The complex area was very nice & quiet. We thoroughly enjoyed our week in Breckenridge and look forward to returning again!